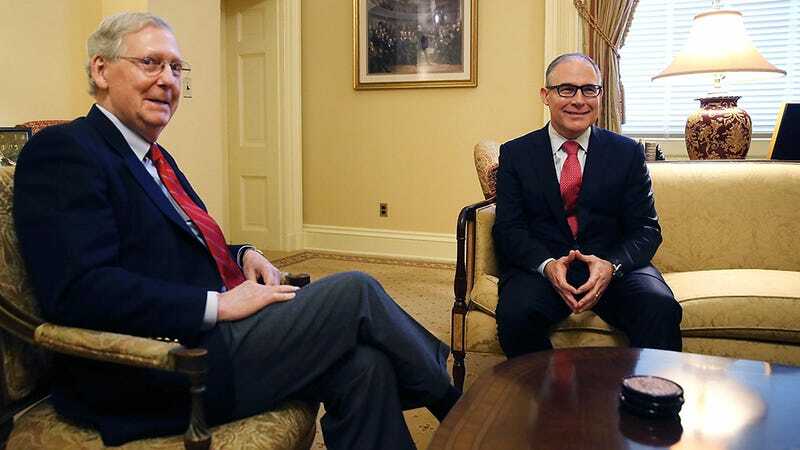 Scott Pruitt, the recently confirmed head of the Environmental Protection Agency, spoke at the Conservative Political Action Conference (CPAC) yesterday. He announced his plans for rolling back regulations and said that what he wants for the agency is what the American people want. He is wrong. Pruitt was a controversial pick to lead the EPA for many reasons, the most prominent being that he loves suing the agency and he takes his orders from the world’s biggest polluters. This week, an enormous batch of damning email correspondence between Pruitt and the fossil fuel industry was released. And on Friday, it was confirmed that he lied under oath to congress about using a private email server while he was attorney general in Oklahoma. Pruitt would only need to check with the EPA to find analysis of the ways that climate change harms the quality of our air and water. But we could spend all day rebutting various wrongheaded details from his CPAC interview. If by people, he means his friends in the fossil fuel industry, he’s probably correct. But the public at large does not generally hold an unfavorable view of the EPA. What should be given greater priority? Thinking about what is said in the news, in your view is the seriousness of global warming? In category after category, the majority of the public agrees with the 97% of actively publishing scientists—climate change is serious and caused by humans. And despite the fact that only 42 percent of the public consider themselves environmentalists, 57 percent believe that the U.S. government is doing too little to protect the environment. How does that compare to the IRS? Pew Research found in 2013, that 44 percent of Americans had a favorable view of the tax collecting agency. Compare that with the 62 percent of Americans who had a generally favorable view of the EPA. More recently, Pew found in 2015 that the public’s biggest criticism of the IRS is that corporations don’t pay their fair share of taxes—another point that would likely find Pruitt’s corporate friends at odds with the majority of Americans. As an appointed official, Pruitt won’t directly need to worry about the public’s perception of his performance. But his boss, the president, will. Considering the fact that Trump has historically low favorability ratings for an incoming president, one might think there’s nowhere to go from here but up. If this administration has taught us anything so far, it’s expect the unexpected.